Griffin Heating & Cooling is a family business, locally owned and operated since 1985. We are a service, repair and retrofit company specializing in Commercial and Residential HVAC as well as Commercial Refrigeration. We offer 24 hour emergency service to Deschutes, Crook, Jefferson and Klamath counties. Our team consists of factory trained/certified HVAC-R technicians with over 90 years of combined experience in the heating - cooling - refrigeration industry. Our clients include management/leasing agents and building owners/operators. We currently service but are not limited to commercial office buildings, hotels, restaurants, and residential properties. We pride ourselves on quality and our attention to detail. 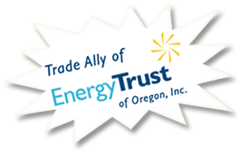 Griffin Heating & Cooling was named Trade Ally of the Month in May 2012 by the Energy Trust of Oregon for our efforts in increasing the energy efficiency in Central Oregon.